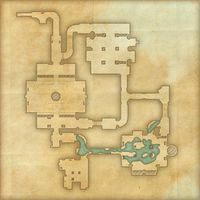 This article is about the dungeon. For the related note, see Black Vine Ruins (note). The name of the long-dead Ayleid clan that built these halls has been forgotten. Their latter-day name is Black Vine, for the writhing, dark vines that spill from the crumbling arches and doorways. 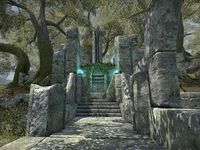 Black Vine Ruins are a set of Ayleid ruins in northeastern Malabal Tor, west of the Baandari Trading Post containing Red Sun bandits. The dungeon is the base of the Red Sun bandits. A Blackvine Strangler can be found deep within the ruin. 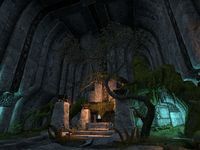 Brothers and Bandits: Help two brothers recover some medicinal plant sap from an Ayleid ruin. This page was last modified on 26 March 2019, at 02:30.